First you had to express an interest NOW it is time to register. SO sign up now. Residents living in the suburbs of Chapman, Duffy, Fisher, Holder, Rivett, Stirling, Waramanga, Weston and Kambah are now able to register to be part of the pilot. 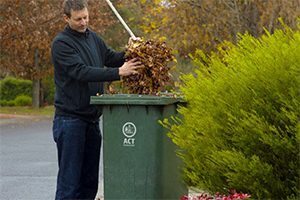 Residents who opt-in to register will receive a 240 litre lime-green lidded green waste bin starting from March 2017 for all their garden vegetation waste. Kerbside collections will start in April 2017. A one-off fee of $50 will be required at the time of registering, unless you are a concession card holder. How do I get a lime-green lidded green waste bin? If you wish to opt-in to receive your green waste bin, please register through the smart form via Access Canberra at the following link www.act.gov.au/greenbins or alternatively you can contact Access Canberra on 13 22 81 who can assist you with your application. Please note that you must register for the service even if you previously expressed interest in the green waste pilot.